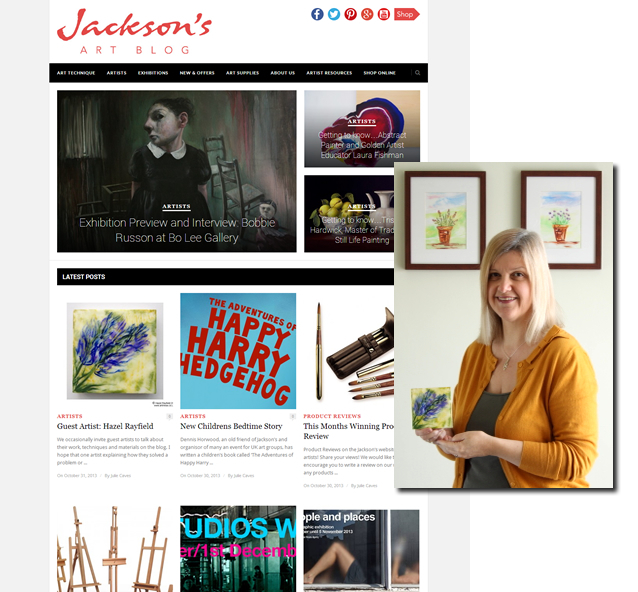 Hazel Rayfield is this weeks featured Artist on the Jackson’s Art Blog ……. Today sees a guest feature of me talking about Art In Wax on the Jackson’s Art Blog. Julie from Jackson Art and I got in contact via twitter when I tweeted about using their plywood panels in my work. The guest post, which in an interview style talks about how I got started painting in encaustic wax and how I am now painting on wood panels. The article also includes some pictures of my work on the wood panels together with some photos showing the process of painting a sunflower head one of the 4 x 4 inch wood plywood panel. Here you’ll find the World’s finest art materials and equipment at exceptionally low prices. Run by artists for artists, we are passionate about what we sell and our consistently high customer service. With over 36,000 fine art supply products, visual artists around the world see Jackson’s as their favourite art supplies one stop shop.